This article is about the Beatles song. For the album by Supertramp, see Free as a Bird (album). For the Lynyrd Skynyrd song, see Free Bird. For the concept in Germanic law, see Vogelfrei. "Free as a Bird" is a song originally composed and recorded in 1977 as a home demo by John Lennon. In 1995, a studio version of the recording, incorporating contributions from Paul McCartney, George Harrison and Ringo Starr, was released as a single by the Beatles. It was released 25 years after the break-up of the band and 15 years after the death of Lennon. The song was very successful around the world, peaking at No. 2 on the UK Singles Chart, No. 3 in Sweden, and No. 6 on the US Billboard Hot 100. It also became a top-ten hit in Australia, Canada, Finland, Ireland, the Netherlands and Spain, and it charted strongly in several other countries, including Belgium and Norway. The music video for "Free as a Bird" was produced by Vincent Joliet and directed by Joe Pytka; shot from the point of view of a bird in flight, it features many references to Beatles songs, such as "Strawberry Fields Forever," "Penny Lane", "Paperback Writer", "A Day in the Life", "Eleanor Rigby", "Revolution", and "Helter Skelter". 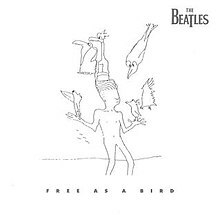 "Free as a Bird" won the 1997 Grammy Award for Best Pop Performance by a Duo or Group with Vocal and was the Beatles' 34th Top 10 single in the United States. The song secured the group at least one Top 40 hit in four different decades. McCartney, Harrison and Starr originally intended to record some incidental background music, as a trio, for the Anthology project, but later realised, according to Starr, that they wanted to record "new music". According to Harrison, they had always agreed that if one of them was not in the band, the others would never replace them and, "... go out as the Beatles", and that the "only other person that could be in it was John." McCartney then asked Ono if she had any unreleased recordings by Lennon, so she sent him cassette tapes of four songs. "Free as a Bird" was recorded by Lennon in 1977, in his and Ono's Dakota building apartment in New York City, but was not complete. Lennon introduced the song on the cassette by imitating a New York accent and saying, "Free—as a boid" (bird). The other songs were "Grow Old With Me", "Real Love", and "Now and Then". Ono says that it was Harrison and former Beatles road manager Neil Aspinall who initially asked her about the concept of adding vocals and instrumentation to Lennon's demo tapes. Ono stated: "People have said it was all agreed when Paul came over to New York to induct John into the Rock and Roll Hall of Fame, but it was all settled before then. I just used that occasion to hand over the tapes personally to Paul." She was there with Sean ... and she played us a couple of tracks. There were two newies on mono cassettes which he did at home ... [s]o I checked it out with Sean, because I didn't want him to have a problem with it. He said, "Well, it'll be weird hearing a dead guy on lead vocal. But give it a try." I said to them both, "If it doesn't work out, you can veto it." When I told George and Ringo I'd agreed to that they were going, "What? What if we love it?" It didn't come to that, luckily. I said to Yoko, "Don't impose too many conditions on us, it's really difficult to do this, spiritually. We don't know, we may hate each other after two hours in the studio and just walk out. So don't put any conditions, it's tough enough." Ono recognised that she was now in a position of bringing the band back together after previously being criticised for splitting them up. During an interview for the Anthology project, McCartney revealed that he was surprised to learn that Lennon's demos of "Grow Old With Me" and "Real Love" had already been released and were well known by Lennon fans. Starr admitted that when he first listened to the recording he found it very emotional. George Martin, who had produced most of the Beatles' 1960s recordings, turned down an invitation to produce "Free as a Bird" due to hearing problems (though he subsequently managed to produce and direct the Anthology series). 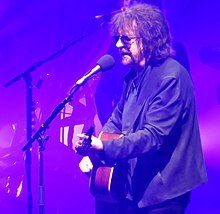 Harrison, in turn, suggested Jeff Lynne as producer (founding member of Electric Light Orchestra and co-producer of Harrison's 1987 album, Cloud Nine) and work commenced at McCartney's studio in February 1994. Harrison expressed a desire to work with Lynne or he would not involve himself in the project. Geoff Emerick and Jon Jacobs were chosen to engineer the new tracks. The original 1977 tape of Lennon singing the song was recorded on a mono cassette, with vocals and piano on the same track. They were impossible to separate, so Lynne had to produce the track with voice and piano together, but commented that it was good for the integrity of the project, as Lennon was not only singing occasional lines, but also playing on the song. Although Lennon had died in 1980, Starr said that the three remaining Beatles agreed they would pretend that Lennon had "gone for lunch", or had gone for a "cup of tea". The remaining Beatles recorded a track around Lennon's basic song idea, but which had gaps they had to fill in musically. Some chords were changed, and the arrangement was expanded to include breaks for McCartney and Harrison to sing extra lines. Harrison played slide guitar in the solo. The Beatles' overdubs and production were recorded between February and March 1994 in Sussex, England, at McCartney's home studio. It ends with a slight coda including a strummed ukulele by Harrison (an instrument he was known to have played often) and the voice of John Lennon played backwards. The message, when played in reverse, is "Turned out nice again", which was the catchphrase of George Formby. The final result sounds like "made for John Lennon", which, according to McCartney, was unintentional and was only discovered after the surviving Beatles reviewed the final mix. When Starr heard McCartney and Harrison singing the harmonies, and later the finished song, he said that it sounded just like them [the Beatles]. He explained his comment by saying that he looked at the project as "an outsider". Lynne fully expected the finished track to sound like the Beatles, as that was his premise for the project, but Harrison added: "It's gonna sound like them if it is them... It sounds like them now." McCartney, Harrison and Starr all agreed that the recording process was more pleasurable than when they later recorded "Real Love" (the second song chosen for release); as the latter was almost finished, they had very little input, and felt like sidemen for Lennon. The music video for "Free as a Bird" was produced by Vincent Joliet and directed by Joe Pytka and depicts, from the point of view of a bird in flight, many references to Beatles songs, such as "Penny Lane", "Paperback Writer", "A Day in the Life", "Eleanor Rigby", "Helter Skelter", "Piggies", "The Continuing Story of Bungalow Bill", "Strawberry Fields Forever", "Doctor Robert", and "The Fool on The Hill". Between 80 and 100 allusions to the Beatles' story, music and lyrics in the video have been estimated. Although the bird can be heard at the beginning of the video, it is never seen. Neil Aspinall (Apple Records executive at the time) said that this was because no-one could agree on what kind of bird it should be. Pytka had to send his ideas to McCartney, Harrison and Starr, as well as Ono, to make sure they all agreed before he could proceed with the filming of the video. Derek Taylor (ex-Apple Records executive) sent a two-page letter to Pytka confirming that he could proceed, and personally encouraged and supported Pytka's ideas. The video was filmed in as many authentic locations as possible: Penny Lane was made by Pytka's art department to look as it was in the 1950s, and other locations filmed were The Liver Building, and Liverpool Docks (as a reference to Lennon's father Alfred Lennon). Although Pytka fixed the ideas on a storyboard, he abandoned it as soon as filming began, and followed ideas based on what angles and perspectives the steadycam camera produced. One instance was the filming of the car crash, which Pytka filmed for hours from above, but realised that a steadycam shot on the ground was a much better idea. The inclusion of the car registration number 847 BHN on a police van in the Day in the Life crash sequence alludes to John and Yoko's commitment to the case of James Hanratty, hanged in 1962 for the A6 murder (then a contentious case, but proven guilty by DNA evidence in 2002). Archiveage was used by imposing it on scenes shot by Pytka, who utilised a greenscreen stage to digitally blend it into the finished film, such as Paul's Old English Sheepdog in the graveyard, and the elephant in the ballroom procession scene. The elephant was put in last, as Aspinall phoned Pytka and said that Starr liked the scene, but insisted an elephant be put in it, which Pytka later did, as he had already put a sitar in at the request of Harrison. Apart from the steadycam shots, Pytka used a Russian-made Akil-crane for sweeping overhead shots, such as the Abbey Road zebra crossing shot at the end, as well as a remote-controlled toy helicopter with a camera added to it for intricate aerial shots. To make it more interesting, two Blue Meanies make cameos. Harrison played the ukulele in the studio for the song, and asked to appear as the ukulele player seen only from behind at the very end of the video. Pytka resisted this, as he felt it would be wrong for any contemporary members of the Beatles to appear on screen. Pytka later stated that it was "heartbreaking" that Harrison had not played the role, particularly after Harrison's death in 2001 and upon discovering that the ukulele was not a sample of an old song as Pytka had assumed. The video won the Grammy Award for Best Short Form Music Video in 1997. Coronation Street actress Kate Ford stars in the video. On 6 November 2015, Apple Records released a new deluxe version of the 1 album in different editions and variations (known as 1+). Most of the tracks on 1 have been remixed from the original multi-track masters by Giles Martin. Giles Martin, with Jeff Lynne, also remixed "Free as a Bird" to accompany the music video for the DVD and Blu-ray releases. The remix of "Free as a Bird" cleans up Lennon's vocal further, and uses a different take of Harrison's vocal phrase, replacing the lyric "whatever happened to the life that we once knew" with "whatever happened to the love that we once knew". Towards the end of the track, this version also contains a clip of Lennon stating the phrase "turned out nice again" played forward—which was played backwards in the original mix of the song. McCartney's lead vocal, buried in the original mix to serve as a double-track for Lennon's own vocal, can now be heard more prominently in the second verse. "Free as a Bird" marked the first time a single containing new material had been released under the Beatles' name since "The Long and Winding Road" in the United States in 1970. The promotional video was broadcast during episode one of The Beatles Anthology that aired on ITV in the UK and ABC in the US. "Free as a Bird" was greeted with mixed reviews. Its release was criticised by Caroline Sullivan in The Guardian as a publicity gimmick, exploiting the Beatles brand, and owing less to the Beatles than to Lynne. Andy Gill in The Independent called the song "disappointingly low-key. ... George's guitar weeps gently enough when required, but the overall effect is of a dirge." Ian MacDonald, writer of Revolution in the Head, declared it to be a "dreary song" that stood no comparison with the Beatles' sixties music. Chris Carter, now the host of Breakfast with the Beatles, commented: "I would value any song (especially if it was great) performed by John, Paul, George and Ringo, no matter how (or when) it was recorded." "Free as a Bird" later won the 1997 Grammy Award for Best Pop Performance by a Duo or Group with Vocal. "Free as a Bird" was premiered on BBC Radio 1 in the early hours of 20 November 1995. It was released as a single in the UK on 4 December 1995, two weeks after its appearance on the Anthology 1 album. The single sold 120,000 copies in its first week, entering the UK Singles Chart at No. 2. It remained on the chart for eight weeks. In the US, the song reached No. 6 on the Billboard Hot 100, becoming The Beatles' 34th Top 10 single in America. It was the group's first Top 10 song in the U.S. in nineteen and a half years, the longest span for the group between Top 10 hits since first charting in America in 1964. All songs written by John Lennon, Paul McCartney, George Harrison and Ringo Starr, except where noted. This version (take 9) was recorded after the version released on the album Please Please Me (take 1). The introductory count-in from take 9 was edited onto the start of take 1 for the album. Two incomplete versions (takes 12 and 13), which both break down into laughter. ^ The Beatles Anthology DVD 2003 (Special Features: Recording Free as a Bird and Real Love - 0:00:50–0:01:04) Starr talking about the idea of recording incidental music for the Anthology project. ^ The Beatles Anthology DVD 2003 (Special Features: Recording Free as a Bird and Real Love – 0:01:25–0:01:46) Harrison talking about their agreement that if one of them wasn't there, they could be not replaced, and that only Lennon could be the fourth Beatle. ^ The Beatles Anthology DVD 2003 (Special Features: Recording Free as a Bird and Real Love - 0:02:07-0:02:17) Starr talking about McCartney asking Ono for unreleased songs by Lennon. ^ "Bands tempted by reunion lucre". BBC. 20 December 2001. Retrieved 19 February 2008. ^ a b c Corliss, Richard (24 June 2001). "Free as a Beatle". Time. Retrieved 22 February 2008. ^ a b c d "The Beatles' biography". Rolling Stone. Archived from the original on 16 February 2008. Retrieved 19 February 2008. ^ a b c Facts, Song. "Free As A Bird by The Beatles". Songfacts. Retrieved 21 February 2008. ^ The Beatles Anthology DVD 2003 (Special Features: Recording Free as a Bird and Real Love – 0:02:17–0:02:28) McCartney talking about how Lennon versions of "Free As A Bird" and "Real Love" were released and heard by fans even before the surviving ex-Beatles had heard them. ^ The Beatles Anthology DVD 2003 (Special Features: Recording Free as a Bird and Real Love – 0:02:28–0:03:10) Starr talking about how emotional the recordings were. ^ a b MacDonald 1997, p. 331. ^ Doggett, Peter (2011). You Never Give Me Your Money: The Beatles After the Breakup. New York, NY: It Books. ^ The Beatles Anthology DVD 2003 (Special Features: Recording Free as a Bird and Real Love – 0:03:10–0:03:32) McCartney talking about the quality of Lennon's demo cassette. ^ The Beatles Anthology DVD 2003 (Special Features: Recording Free as a Bird and Real Love – 0:03:33–0:04:00) Lynne talking about the quality of, and working with Lennon's demo cassette. ^ The Beatles Anthology DVD 2003 (Special Features: Recording Free as a Bird and Real Love – 0:02:28–0:03:10) Starr talking about the absence of Lennon during the recordings. ^ The Beatles Anthology DVD 2003 (Special Features: Recording Free as a Bird and Real Love - 0:03:33) Starr talking about the musical gaps in the song. ^ The Beatles Anthology DVD 2003 (Special Features: Recording Free as a Bird and Real Love – 0:03:50) Harrison talking about changing chords and arrangement in the song. ^ The Beatles Anthology DVD 2003 (Special Features: Recording Free as a Bird and Real Love – 0:06:47) McCartney talking about recording and finishing the song. ^ Montagne's, Renee (26 November 2002). "Paul McCartney Gets Back to The Beatles". NPR. Retrieved 28 January 2008. ^ O'Hagan, Sean (18 September 2005). "Macca beyond". The Observer. Retrieved 28 January 2008. ^ The Beatles Anthology DVD 2003 (Special Features: Recording Free as a Bird and Real Love – 0:06:26) Starr talking about how the finished song sounded "just like them" (The Beatles). ^ The Beatles Anthology DVD 2003 (Special Features: Recording Free as a Bird and Real Love - 0:06:47) Lynne and Harrison talking about how the finished song sounded "just like them" (the Beatles). ^ The Beatles Anthology DVD 2003 (Special Features: Recording Free as a Bird and Real Love – 0:08:09) McCartney talking about recording "Real Love". ^ "The Beatles Anthology" DVD 2003 (Special Features: Making the Free as a Bird video - 0:04:44) Pytka talking about the storyboard. The video alludes to Lennon and Yoko's involvement in the campaign for James Hanratty, hanged in 1962, by using the murder car's registration for a police van in the A Day in the Life crash scene - 847BHN. ^ Gilmore, Mikal (5 December 2005). "Lennon Lives Forever". Rolling Stone. Archived from the original on 13 February 2008. Retrieved 22 February 2008. ^ "Sir Paul McCartney - Singer/Songwriter". BBC h2g2. Retrieved 22 February 2008. ^ Sullivan, Caroline (21 November 1995). "Do they believe in yesterday?". The Guardian. Retrieved 29 October 2011. ^ Gill, Andy (22 November 1995). "Money can buy you love". The Independent. Archived from the original on 15 June 2008. Retrieved 10 March 2008. ^ Rense, Rip (21 August 2005). "One More Beatles Song, or Should They Just Let It Be?". The Rip Post. Retrieved 10 March 2008. ^ Ingham, Chris (2003). The Rough Guide to the Beatles. Rough Guides. p. 92. ISBN 1-84353-140-2. ^ British Hit Singles and Albums. Guinness World Records. 2006. p. 49. ISBN 1-904994-10-5. ^ "Free as a Bird chart position". Billboard. Archived from the original on 15 June 2013. Retrieved 8 March 2008. ^ MacDonald 1997, p. 330. ^ "Australian-charts.com – The Beatles – Free as a Bird". ARIA Top 50 Singles. Retrieved 17 May 2016. ^ "Austriancharts.at – The Beatles – Free as a Bird" (in German). Ö3 Austria Top 40. Retrieved 16 May 2016. ^ "Ultratop.be – The Beatles – Free as a Bird" (in Dutch). Ultratop 50. Retrieved 16 May 2016. ^ "Ultratop.be – The Beatles – Free as a Bird" (in French). Ultratop 50. Retrieved 16 May 2016. ^ "Top RPM Singles: Issue 2864." RPM. Library and Archives Canada. Retrieved 20 March 2018. ^ "Top RPM Adult Contemporary: Issue 2859." RPM. Library and Archives Canada. Retrieved 20 March 2018. ^ "The Beatles: Free as a Bird" (in Finnish). Musiikkituottajat – IFPI Finland. Retrieved 16 May 2016. ^ "Lescharts.com – The Beatles – Free as a Bird" (in French). Les classement single. Retrieved 16 May 2016. ^ "Offiziellecharts.de – The Beatles – Free as a Bird". GfK Entertainment Charts. Retrieved 17 May 2016. ^ "The Irish Charts – Search Results – Free as a Bird". Irish Singles Chart. Retrieved 16 May 2016. ^ "Nederlandse Top 40 – week 51, 1995" (in Dutch). Dutch Top 40 Retrieved 11 May 2018. ^ "Dutchcharts.nl – The Beatles – Free as a Bird" (in Dutch). Single Top 100. Retrieved 16 May 2016. ^ "Charts.nz – The Beatles – Free as a Bird". Top 40 Singles. Retrieved 16 May 2016. ^ "Norwegiancharts.com – The Beatles – Free as a Bird". VG-lista. Retrieved 16 May 2016. ^ "Swedishcharts.com – The Beatles – Free as a Bird". Singles Top 100. Retrieved 16 May 2016. ^ "Swisscharts.com – The Beatles – Free as a Bird". Swiss Singles Chart. Retrieved 16 May 2016. ^ "The Beatles Chart History (Adult Contemporary)". Billboard. Retrieved October 21, 2017. ^ "The Beatles Chart History (Adult Pop Songs)". Billboard. Retrieved October 21, 2017. ^ "The Beatles Chart History (Mainstream Rock)". Billboard. Retrieved October 21, 2017. ^ "The Beatles Chart History (Pop Songs)". Billboard. Retrieved October 21, 2017. ^ "RPM Year End Top 100 Hit Tracks". RPM. Library and Archives Canada. Retrieved 1 March 2019. ^ "RPM Year End Top 100 Adult Contemporary Tracks". RPM. Library and Archives Canada. Retrieved 1 March 2019. ^ "British single certifications – The Beatles – Free as a Bird". British Phonographic Industry. Retrieved 15 May 2016. Select singles in the Format field. Select Silver in the Certification field. Type Free as a Bird in the "Search BPI Awards" field and then press Enter. ^ "American single certifications – The Beatles – Free as a Bird". Recording Industry Association of America. Retrieved 15 May 2016. If necessary, click Advanced, then click Format, then select Single, then click SEARCH. The Beatles (2003). The Beatles Anthology (DVD). Apple records. ASIN B00008GKEG. The Beatles (2002). The Beatles Anthology. San Francisco: Chronicle Books. ISBN 978-0-8118-3636-4. Everett, Walter (1999). The Beatles As Musicians: Revolver through the Anthology. New York: Oxford University Press. ISBN 978-0-19-512941-0. This page was last edited on 11 April 2019, at 14:21 (UTC).